Noel Coward, in his play ‘Private Lives’, wrote the famous phase, “Very flat, Norfolk”. That, of course is not true. Much of Norfolk is, if not hilly, at least composed of nicely rolling countryside. The part that is flat — totally flat, near enough, with those huge, East Anglian skies — is the fens, and there is more of that type of land in Lincolnshire and Cambridgeshire than in Norfolk. 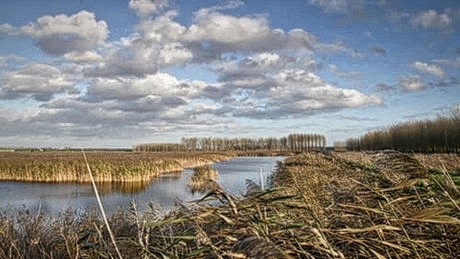 Fenland is the area principally around the rivers Welland, Nene and Great and Little Ouse. It is made up — or was, in its natural state — of areas of marsh, mere and meadowland, criss-crossed by a mass of shifting ditches and streams. Essentially it is a river delta, beginning somewhere close to Cambridge and ending in The Wash. In the summer, it is often dry. In winter, especially when high tides and east winds combine, it can still be flooded over wide areas. Its rivers are partly tidal and their mouths provided the important mediaeval ports of Boston, Wisbech and King’s Lynn — until silting and draining more or less closed all but the last. Throughout the 17th Century, vast drainage works had been undertaken to try to dry out the Fenland. New drains were dug to carry the water quickly to the rivers and thence to the sea. New rivers were then provided, usually running straight for miles, to avoid silting and improve the flow. Sluices were added to direct the water and control the effects of the tides. The reason for so much work was simple. Once freed from floods, the land’s natural fertility would provide outstanding levels of cropping. If you want today to see how this ‘natural’ drainage worked, one of the simplest ways is to visit the nature reserve at Welney Marshes. Here the Old and New Bedford rivers, both man-made and dating to the 17th century, run parallel, their water levels both many feet higher than the land surface between them. This huge area between the two is designed to fill with water during winter floods, thus limiting the amount moving sluggishly towards the natural outfall of the Great Ouse, while the water in the two man-made channels flows steadily at a rate the river-mouth can usually cope with. All attempts to drain using the natural flow of the rivers failed. The single outfall to the sea at King’s Lynn used to drain the vast majority of the southern and central fens was insufficient, especially in times of spring tides and easterly winds. What made things even worse was ignorance of a key aspect of the fen topography. It did not seem to be understood for many years that constant drainage causes the underlying peat to shrink, eventually lowering the land level by as much as a dozen feet or more (4m). Drive through the Fens today, and the road you are on will usually be far above the level of the fields on either side. It had long been obvious that the only way to maintain a steady outflow of water was to use pumps to lift the water into the drains, then from the drains into the rivers and so on towards the sea. So why was so little was done to provide such a system? The reason was the muddle of local jurisdictions that had been established. Each one was solely responsible for its own area of the Fens. Each raised local taxes to pay for its schemes. None had any responsibility, or urge, to co-operate with its neighbours. As a result, pumping meant moving the water out of your own area to drown nearby ones. There were a few attempts were made to arrange things better. The General Drainage Act of 1663 gave jurisdiction over the whole of the ‘Great Level’ or ‘Bedford Level’ of the River Ouse to a governor and corporation meeting in London. Yet even this attempt to provide co-ordination produced more acrimony than dry land. The Bedford Level and other Corporations were obliged to maintain the existing drainage channels. It was not their task build more or change the methods of draining. Nor could the various vested interests even agree on what was to be done. Instead, faced with ever-increasing pressures on an inadequate system, the Corporation made many orders to stop the use of pumps. The increased amount of water only caused existing drains to overflow and cause flooding elsewhere. It was stalemate. By the eighteenth century, then, it had become clear nothing else but pumping on a large scale could deal with the water. Either pumps had to be installed or the land would be lost. There was no alternative. This may have helped with local problems for a while. Yet the dumping of still more water into the drains and rivers bound to lead to longer-term trouble. While drainage by pumps increased, all depended on the blind hope that the water would somehow make its way to the sea. The whole vast area of the central and lower fens became a mass of small, intersecting cuts and drains fed by wind-pumps. The water they removed was directed into central drains, then raised, yet again by wind-pump, into either man-made arterial waterways or the natural rivers. From these, it was presumed — or hoped — it would flow to the sea. Naturally, it did not, especially in winter, when flooding was most widespread. The system only transferred the problem elsewhere. The port of King’s Lynn, located on the final outlet, the mouth of the Great Ouse, had always been particularly susceptible to regular combinations of heavy rains, easterly winds and high tides. These were now made worse by all the extra water and silt produced further inland on the Bedford and other Levels. The more the land dried out, the less the natural flow of the water became, until wet weather and high tides could easily make it reverse its flow, pouring fen waters back up the Ouse towards Ely and Cambridge. Sluices were built to prevent such backward flows, then ship-owners complained they blocked essential navigation. When the main Denver sluice was overwhelmed and destroyed by the flood-water, chaos ensued and it had to be rebuilt. Water transport inland ceased. The port of King’s Lynn was plagued by continual silting. It was stalemate again. It would be tedious in the extreme to try to trace the mass of conflicting reports, law-suits, parliamentary debates and bills that this produced well into the twentieth century. 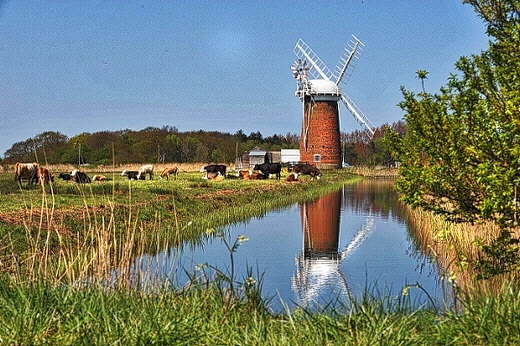 More interesting would be a visit to one of the few remaining wind-pumps in good condition, ironically not in the Fens themselves, but at Horsey Mere in the Norfolk Broads. Eventually wind-pumps gave way to steam, then diesel and electric pumps. Central co-ordination of drainage was established. Yet the Fens themselves, still one of the most productive farming areas in the country, are kept dry today by the same methods established in the 18th century: pumps, cuts, drains, sluices and rivers. The shrinkage of the peat goes on. The surface of the land is steadily falling further and further below sea-level in many areas. Should the drainage ever fail — or should global warming raise sea levels faster than the system can cope with — this huge area of eastern England will probably become a vastly extended version of The Wash. Ely will stand on an island and Cambridge will be noted for its beach huts and sands!